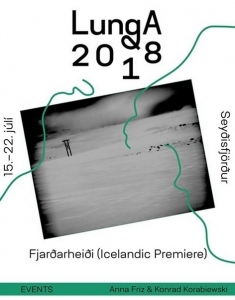 Skálar | Sound Art | Experimental Music, in collaboration with LungA Art festival 2018 presents the Icelandic premiere of ‘Fjarðarheiði’, an installation by Anna Friz (ca) and Konrad Korabiewski (dk/is/pl). An audiovisual installation which contemplates physical and signal landscapes, strongly influenced by the extreme oscillation between daylight and darkness characteristic of life over the year in the far north. Fjarðarheiði is taken from the name of the mountain pass which connects the village of Seyðisfjörður to Egilsstaðir, East Iceland, a road constantly transformed by dense fog, wind, rain, and snow storms. If afterglow refers to the light or luminance left in the sky after sundown, “aftergrain” is the sonic and visual grit that remains when most other frequencies are subtracted. This installation explores such expressive low-fidelity landscapes and infrastructures through field recordings and feedback systems, accompanied by Friz’ monochrome two-channel photomontage. Fjarðarheiði had world premiere as audiovisual performance in 2015 at 44th Festival Nouveau Cinéma, Montréal, Québec/Canada, and was since also presented in Germany, Chile, and Austria.